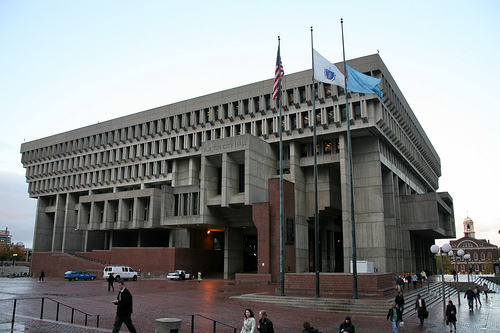 Fifty years ago, city fathers opened Boston City Hall, the place where the city’s business is handled, where citizens get building permits, where tourists come to gawk and where many entertainment events are offered to the public. Mayor Marty Walsh and a group of city officials commemorated Boston City Hall’s 50th birthday on February 7. A poet and lively band were on hand for the celebration. The building architect, Michael McKinnell, who designed what many in Boston call a monstrosity, was also there. McKinnell told the crowd he was impressed with the way the city was using the building. Patrick Brophy, chief of operations for the City of Boston, praised Mayor Walsh for revamping the building and its spacious plaza. People who attended the celebration were constantly commenting on the stunning architecture during the event. Brophy said he has been given the duty of completing the newest renovation of the building, which will include a new coffee shop, a multilingual information kiosk, and an employee-only-entrance. City Councilors Annisa Essaibi-George, Michael Flaherty, Ed Flynn, Frank Baker, and Matt O’Malley were there for Thursday’s event, as well as state Representative Nika Elugardo. The party included refreshments from City Hall’s Recreo Rotisserie, and a City Hall shaped birthday cake created by the Madison Park Culinary Program. Walsh, in his remarks, thanked a previous mayor John Collins, who served from 1961 to 1968, for his “bold idea” of consolidating all government office buildings in Government Center, just down the hill from the State House. “We dedicate the building with the confidence that City Hall will not just be a center of the government, but it will be a motive source in making Boston, in the fullest sense, a community once again,” the mayor said.